Ok here they are my sprites so you don't have to go to PC to find them I also take request but don't get mad if I dont get to them quickly. Your revamped Red backsprite is 100% better then mine. Its not a revamp per say. I just made it look more Gen II compatible. Took me a while to get into fakemon, ideas are hard to come by. Not a fan of Gen V.
However I do feel gen II was the best, something about the 8bit music and 4 color sprites i like. Did you upload these sprites here to be used by permission ? If so, I'll likely use Giovanni and Char in my hack. Also I've played a little of you hack so I'd like to see where Char would fit in. He could be one of the three "captains" of which one is encountered in beta 2 already. Giovanni could work as the big boss unless I get something else to add there (this will make sense if you've battled the captain). Great ones, I really like this sprites good job! May I use some of them (some trainers and many fakémon) on my hack Ulterra Wars? Your work is very good. It's all very... clean. It just looks good. Anyway, I have a request, if you don't mind. 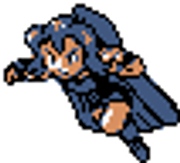 Could you possibly make a Cooltrainer(m) and Lance mix - frontsprite and backsprite? I'm planning on using it for the main character of a hack i'm working on. If it's possible, the walking sprite as well. Thanks a lot! If you need more details about it, let me know. Wow, you've got some excellent sprites. Looking great. Your Red backsprite is absolutely beautiful. I would definitely use this if there was a better frontsprite for Red too. I see you've uploaded one but I can't tell how it's different. It's just that I've never really liked either the front or the backsprite for Red, and now that you have a great backsprite, I would love for you to come up with a brand new frontsprite to match it. Unfortunately, I'm the worst spriter ever >.< But your sprites all look fantastic! Hi. Can I revamp the Lance sprite for the gba games and use it in my hack please? I'll give you credit, I've been looking for a Lance back sprite for a while. I think his front sprite looks good, the back sprite however is a stretched verision of the sprite (as seen with all the backsprites of the first gen) I jus wanted to make it look not as blocky looking. Is it cool if I use the Pallet patrollers and a few of the gym leaders for Prism? I'm not sure which one would look better so your pick. Again, I will be sure to give you credit when I insert it into my hack. Im not sure what you are asking. Koga of Claire? O ok, Itd be easier to just take janine's sprite and place claire's head on it, but I'll post it up next week I'm out of town now. -Possibly new overworld sprite for Oscar + Backsprite for it (I didn't find out how the game defines the palette of player's backsprite so I'd have to make Oscar red for now and then he'd look exactly like Silver in GSC). Still not sure what to do with the Player-menu (where sprite of Cactus is). I need some sprites and I wonder if i could request them. My request is a sprite of Gold and a sprite of Silver for my hack, but 15 years in the future, which means as adults, because my hack Ulterra Wars takes place 15 years after the Gold and Silver events. Hey Poketto would you mind if I used some of your sprites for my hack as long as I give credit? Can you make Zig and Sharko characters and Sprites (with backsides) for pokemon G/S like Marina, Zig, Sharko? you can type "zig and sharko" on google and find the pictures.